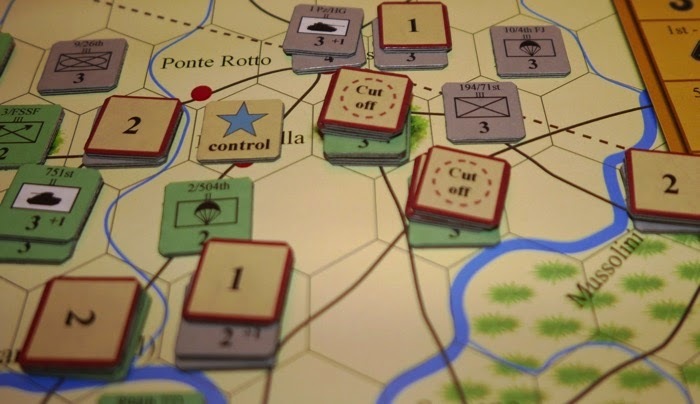 Anzio - It is 1944 and the Allies in an attempt to break the deadlock on the Italian front, make an amphibious landing further up the coast, to fall onto the German rear, cutting lines of communication. The German response is surprisingly rapid and the landing is contained. 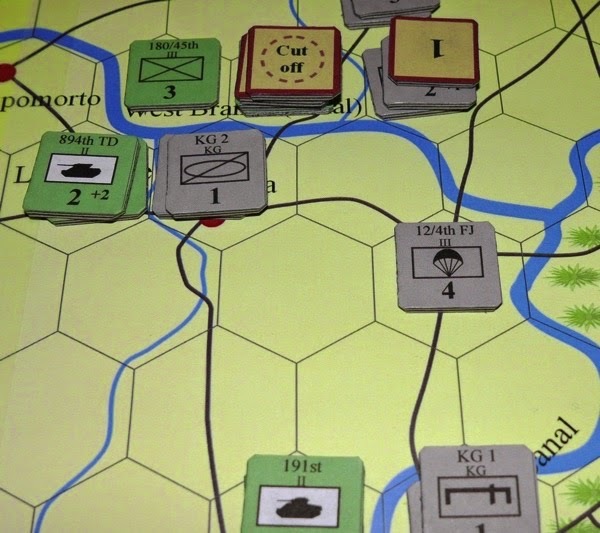 The struggle would continue for months, but this game covers the first six weeks of the campaign, in which both sides had their best chance of winning the battle, making this particular time-frame more interesting to the gamer. For the rest of this post, please click on 'READ MORE'. I should start by saying this is my own design and it is currently available as a paid for download (see footnote for links), so it is a DTP package in which the buyer has to mount their own counters etc. In 2012, the game was donated to the Consimworld Fund Raising drive for anyone who bought a gold level membership, so some readers may already have this game tucked away somewhere within their computer files. The game at one point had been at the contract signing stage with a game company for publication, but in the end, that did not actually come about. Being a DTP product, the user is free to print the game out to whatever size they choose, so it can make a good travel companion. 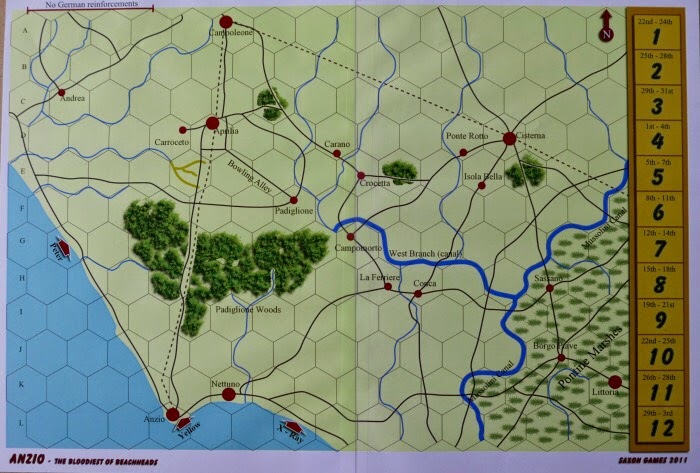 For the purpose of this article, I blew up each of the two map panels to A3 size (the next size up from A4 or letter) and increased the size of the counters and Order of Battle chart to match. Basics - Units are battalions / regiments or brigades. Each hex represents 1.75 miles of ground. Each turn represents either 3 or 4 days, with a pair of turns representing 1 week. There are 12 turns in the game. Stacking is 2 units per hex maximum, but with a maximum of only one regiment or brigade per hex. Once in an enemy Zone of Control (ZoC), units can only disengage if they roll greater than the enemy combat value - special forces (rangers / SSB and FSSF) need not test. Units are single sided and can suffer hits (a hit marker is added) a strength 1 or 2 unit can take 1 hit and then the second hit removes it from play. A stronger unit can take 2 hits and a third hit removes it from play. Combat is voluntary but is limited to one hex attacking one hex, so units in several adjacent hexes cannot 'gang up' in one single attack. Combat is calculated as differentials rather than the more common ratios. Units have their basic combat value plus they may have an anti-tank bonus, this bonus is only added to the units strength if the enemy have armour present (see example below). An interesting unit is the (only) anti-tank gun unit (below). It has a low strength, but a +2 bonus when engaging armour. If stacked with an infantry unit and fighting enemy armour, it will get the bonus, but obviously the enemy armour could not use it's bonus as it is not fighting enemy armour. Getting this unit into protective terrain can make it tough to get past. Some of the German powerful tank formations (with 88mm guns) get a +3 anti-armour bonus. The small square in the bottom left corner denotes a special ability. In this case (below), this is the Brummbär unit that had the 150mm howitzer, ideal for attacking buildings. In the game it only has a combat value of 1, but if attacking a settlement, this value is increased by +4 to +5. Getting it into the right place at the right time is important. The limited road net is important. There had been very heavy downpours and vehicles were largely limited to road movement. Roads also allow for strategic movement by mechanised units. Armour must test (bog check) for each hex that it enters that is off road, if the test fails the unit cannot enter the hex and their movement ends .... ouch! The lateral road is also important and the Allies will want to cut it as the Germans will then find it much harder to shift forces from one side of the battlefield to the other This combined with the disengagement rule and off road penalties makes for some quite interesting moments. Victory is automatic if the Allies exit the map of either northern road while having a supply line going back to the beaches at either Anzio or Nettuno and automatic for the Germans if they capture Anzio or Nettuno or were the last to enter the three road hexes in Padiglione Woods. Otherwise victory is calculated at the end of the game based upon casualties and captured settlements. Isolated units can go out of supply. In this state they cannot attack and do not have a ZoC. If they cannot recover supply in the next supply phase, each unit will take a hit. At the time of making the game available as a download, I produced a short video that demonstrated the game parts and talked a little about the game. A link to that video is in the resource section at the foot of this post. This article will now give way to a replay of the game. The first two turns will be shown in some detail to demonstrate the Sequence of play and initial attacks will be explained. The account will then become generalised to show the flow of the game. At start, the map is empty. All units are set out on their respective Order of Battle cards. Marshes, the settlements there are not worth VP's. Allied Reinforcement Phase - The Allies move their troops for turn 1 from the Order of Battle card and have them ready to enter the game. 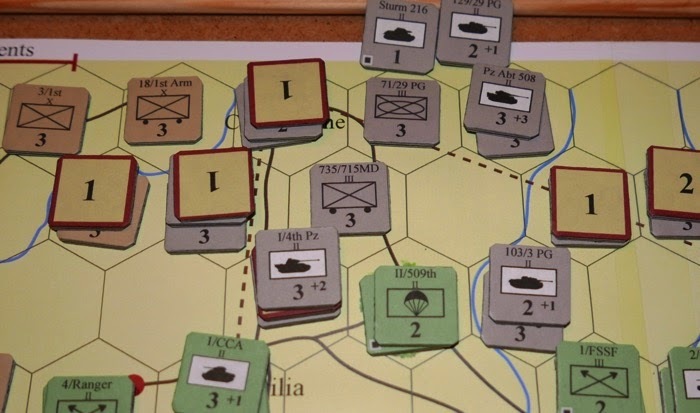 Allied Movement Phase - Units generally have a movement allowance of 4 MPs and there is opportunity for mechanised units to use strategic movement, but on turn 1, the Allies roll against a movement table to see how many MP's they get for this turn (only). All units land and move from one beachhead before the next the beachhead is rolled for. Peter Beach (British), they get 6 MP's. The 46 RTR and 24th Guards Brigade stack (they are the exception to having more than 1 brigade or regiment in a hex at a time) and get next to Carroceto and the wadi (gullies). The 3/1st takes Andrea (top left of map). X-Ray Beach (U.S.), they get 8 MP's (maximum allowed). The 2/504 Para and 15/3rd (Infantry) make it across the Mussolini Canal at Campomorto (centre of the map). Getting a foothold on the other side of the canal is both fortunate and lucky. 191st Tank battalion attempt to come off the road near the beachhead and get bogged down in soft ground. Yellow Beach (U.S. at Anzio town), they also get 8 MP's and move up through Padiglione Woods. They get two battalions into the wadi (gullies) and two next to the Bowling Alley and Padiglione. Allied Combat Phase - none on this turn as the enemy are not on the map. 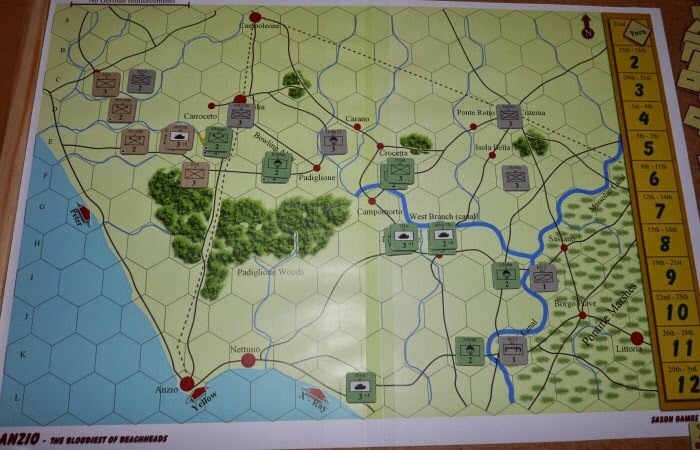 German Supply Phase - Not relevant on turn 1 as the Germans are not on the map. German Reinforcement Phase - The Germans get 3 units that enter from the north and 4 from the east. Two of the eastern units are only strength 1. There are not enough units to fully cover the front. 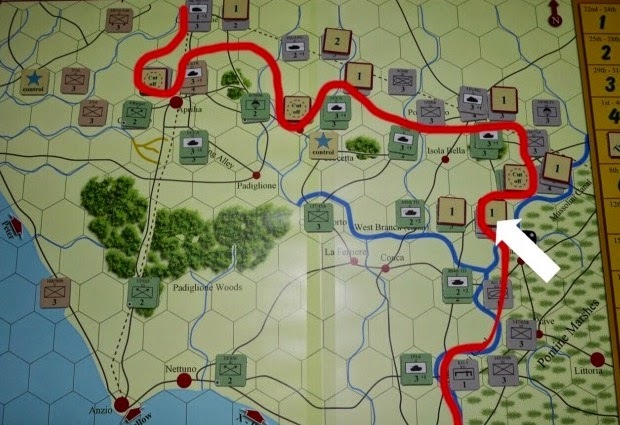 German Movement Phase - The two Kampfgruppe units (strength 1) enter from the east and move to block the bridges in the Pontine Marshes. Importantly, 104/3 Panzer Grenadier Reg, comes in from the north and takes control of Aprilia. 2nd/HG gets into Cisterna and 35/16 SS close the gap between Cisterna and the canal, however, the Germans cannot close the gap between Crocetta and Isola Bella (centre). 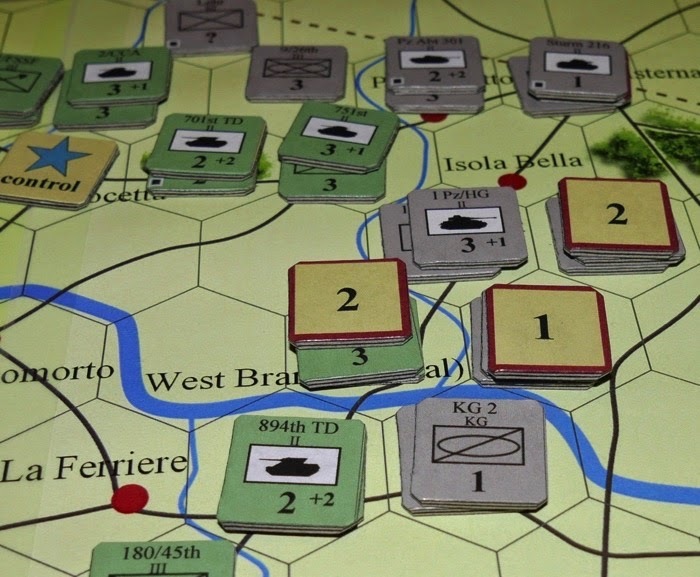 The threat to the centre arises as a combination of the Americans getting a good movement allowance, allowing them to get across the canal and the Germans deciding to deploy the 11/4th FJ to protect the flank of Aprilia. They feel that if a gap is to be left anywhere, then better in the centre, where American armour will lack the roads to penetrate beyond the gap with any ease. 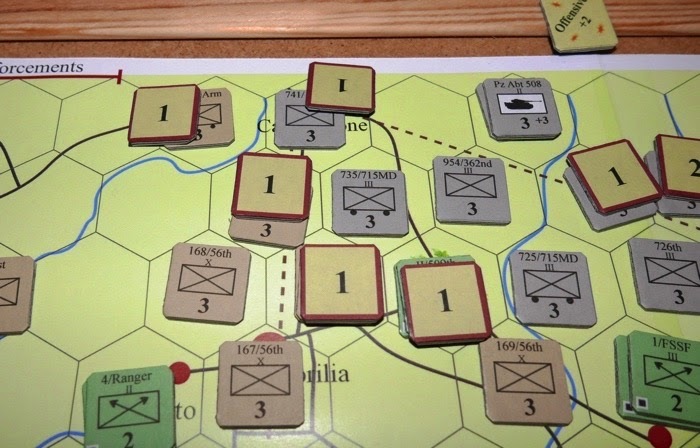 I wanted this design to reflect the fears that each side had of the other by giving the player a taste of that same anxiety - and here, on turn 1, the German player will feel very vulnerable and have a sense of desperately trying to throw a ring around the beachheads before the Allies can break out. German Combat Phase - No attacks, they just cannot risk getting losses or worse .... Attacker Retreat results. Bombardment Phase - Only the Allies bombard, it is to reflect their naval guns and air-power, plus their large stockpiles of artillery ammunition. They will get either 1 or 2 hits every turn and it is most useful against the powerful German armour formations that will start to enter the game and threaten to break through. In this phase they get 1 hit and apply it to the FJ in the centre. Random Event - the roll produces a 'No Event' result. Allied part of the turn. The two British Commando units are withdrawn and they will return to play on turn 12. Reinforcements give the British another infantry brigade, while the U.S. get 3 tank battalions, 1 tank destroyer battalion and 2 infantry regiments. The U.S. manage to get fairly substantial numbers across the canal. Breaching this major obstacle has been a real bonus for them. On the left, the British attack into Aprilia. They only get one decent stack as all their units are brigades and so they will never get two units in a hex - except the 46th Royal Tank Regiment can stack with any British unit. This makes the force largely ineffective once the Germans start to deploy in stacks and go on the offensive against them and they will seek out defensive terrain and choke points. Combat Process (see below) - British attack with strength 3 + 4 = 7 for the 46 RTR and 24th Guards. They could only use the +1 armour bonus if the Germans had armour. The defenders are 3, with +2 for defending a major settlement. The difference of the two values is +2 in favour of the attackers (7 v 5) and a D6 is rolled against the +2 column on the Combat Table. a '4' is rolled giving a Defender Retreat (DR) result. The 104/3 retreats back 1 hex and the attackers advance into the Aprilia hex. In the centre (see below) U.S. forces attack out of Crocetta against the 11/4th FJ (who already have one 1 hit from the bombardment phase). Remember stacks can only attack one at a time, so the paratroopers cannot join in this attack. The defenders get a +1 for being behind a stream. They suffer a retreat, but as they cannot retreat into an enemy Zone of Control, they instead stand and take an additional hit. One more hit and they will be removed from play. 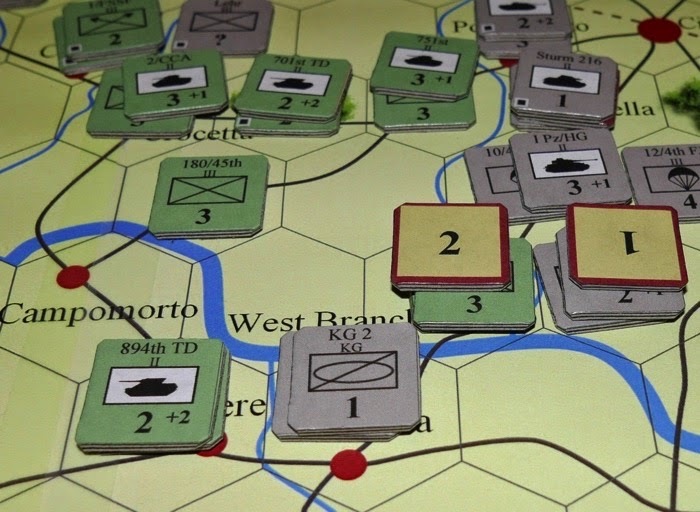 The Para's could now attack, but the stream would make this an 'evens' assault and they do not want to risk an Attacker Retreat result (50% chance of that) and lose their excellent position. On the right in the Cisterna sector, German 35/16 SS receive a D1, so retreat and take a hit. The Americans follow up and the German line is now under a lot of pressure and starting to fragment. German part of the turn. The 11/4th FJ are surrounded so get a cut off marker. They will not be able to attack and they no longer have a zone of control. The Germans get nine reinforcements. Five to the north and four to the east. The important deployments are 67/26th panzer grenadiers and 103/3 panzers which move to Carano to stabilise the centre. At the end of turn 2, the front line is as shown below. The Germans have managed to hold a line, but the Americans have cut the lateral road and so the Germans cannot easily shift forces from one side of the battlefield to the other. and I did not get the white balance on the camera right. Bombardment gives 2 hits. The Random Event gives Anzio Annie, which is the 280mm railroad gun that bombards the Allied rear areas. It allows for 1 Allied unit to be marked (by the German player) to show that it cannot move and it has a strength of 2 for this turn. The British attack from Aprilia, defeat and remove the 104/3 Pz. Grenadiers from play. Campoleone (the route to victory) is dangerously exposed. The German 103/3 PG (far right in above photo), successfully disengage, but get bogged down in off road movement. III/1st FJ were luckily placed to be able to move across and block the British. The Germans are buying time. Their reinforcements (9 units) all arrive in the east! 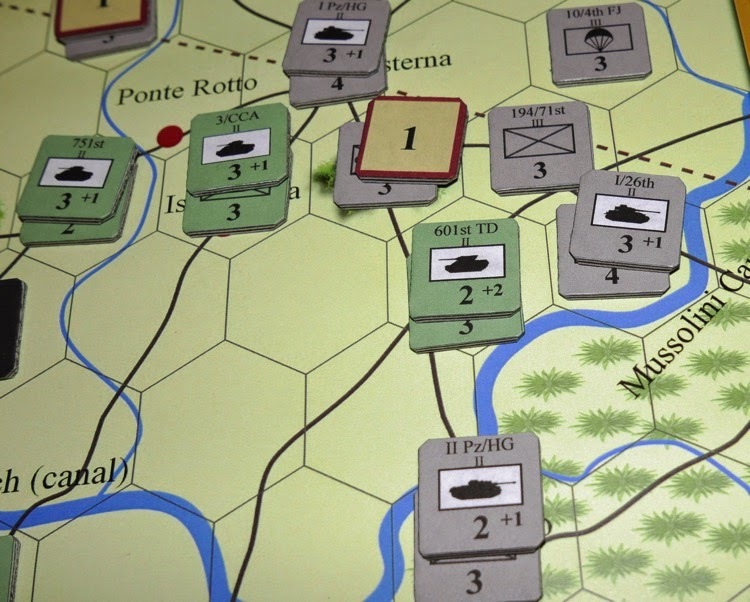 They make use of the lightly defended Pontine Marshes to get into threatening attack positions. 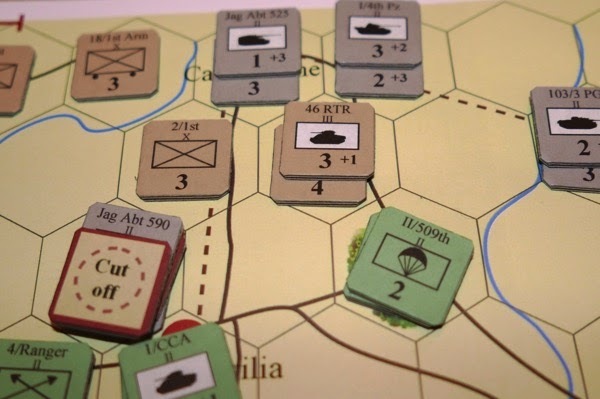 The 601st Tank Destroyer battalion (bottom green unit in the photo below) is attacked and cannot retreat, so takes a hit instead - it will count as being 'cut off' in the next turn. The U.S flank looks vulnerable. Pz 1/26th successfully attack across the canal. Bombardment gives 2 hits. The Random event gives the Germans an offensive bonus, one of their attacks can have a +2 column shift bonus this turn. 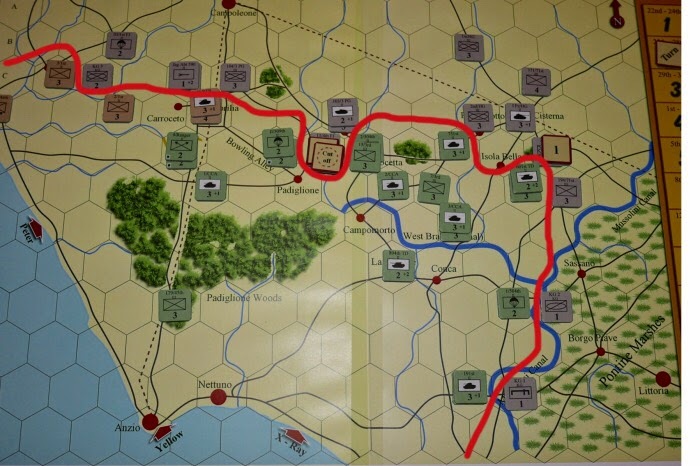 The Aprilia situation is getting desperate for the German player, the Allies just need another turn to bring enough force up to prosecute their final attacks and be in a position to exit the map. German Jagd. 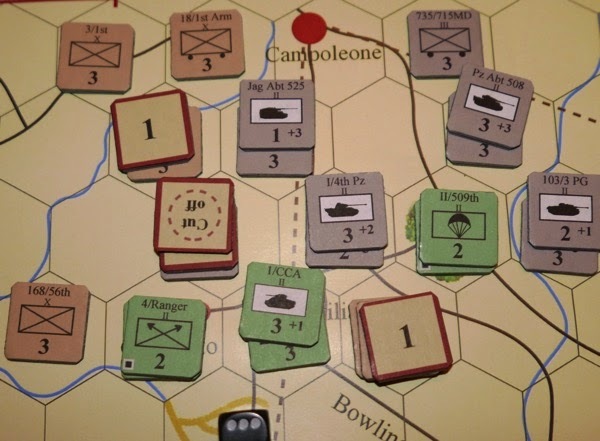 Abt 525 (with Nashorns) arrives and take up position in Campoleone, but 103/3 PG bogs down again! Over by the canal, they use their 'offensive' chit (Random event) to attack across the canal and inflict a D1 result. They are starting to squeeze the U.S. units around the Cisterna area. 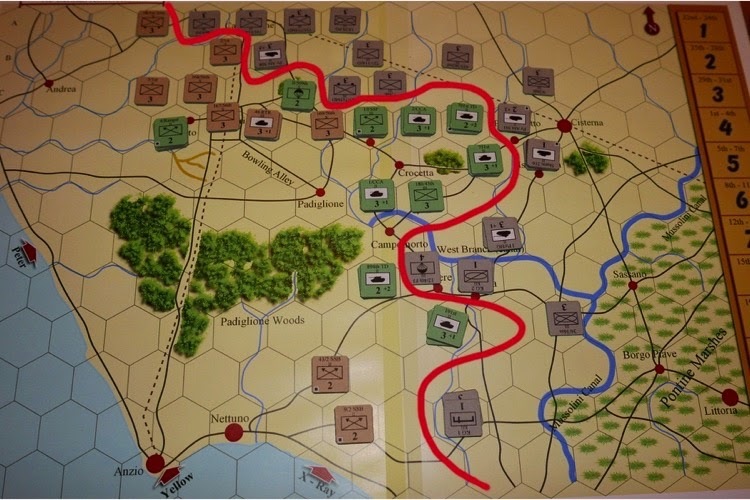 At the end of turn 4, the front line is reflected in the map below. where they cross the canal. Bombardment gives 2 hits and the Random Event is 'Skies Clear' Allied aircraft show up in large numbers and so this turn German movement is reduced from 4 to 3 MP's. A Panther battalion together with Elephant assault guns in support arrive from the north and immediately attack the 46th RTR stack with a +2 advantage. They get a D1, pushing the British back and perhaps signalling reduced chances of the Allies noe being able to break out here. 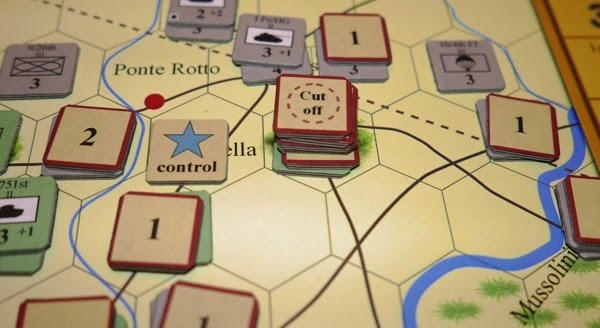 The cut off American forces around Cisterna remain cut off and are now taking losses simply for being out of supply. Rescue looks difficult and so the future of the units is bleak. 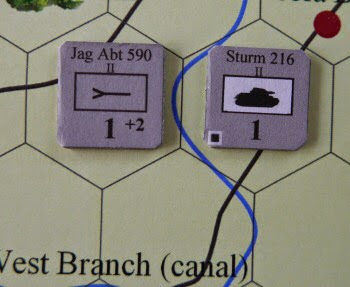 Bombardment gives just 1 hit and the Random Event allows the Germans to remove 1 hit (replacements). (above) U.S. forces have been trapped for a week (2 turns). (above) The Germans get 7 reinforcements in the north - note the Tiger battalion above the U.S. Paratroopers gets a +3 anti-armour bonus. 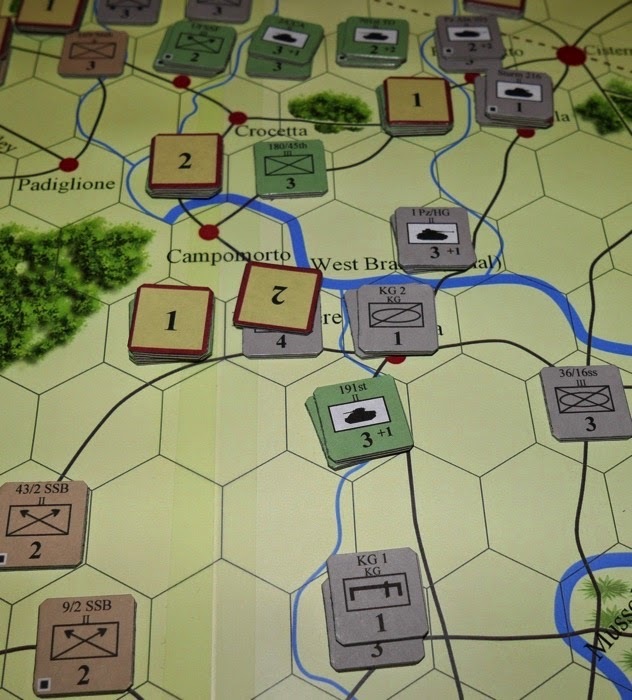 Campolone is relatively safe and they can go over onto the offensive along most of their line. The Panther battalion stack gets adjacent to Aprilia, having pushed 46th RTR further back. Bombardment again only gives 1 hit. The Random Event is 'Luftwaffe make an appearance' - one Allied unit is marked and they take a bog check for every hex they move into this turn. 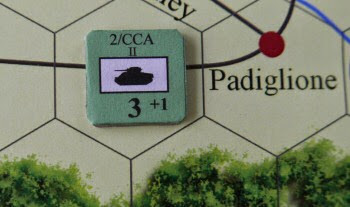 U.S. 30/3rd Infantry are lost due to the deteriorating supply situation near Cisterna and the other stack is on its last legs. There is no hope of help. placed on their attempted point of entry. 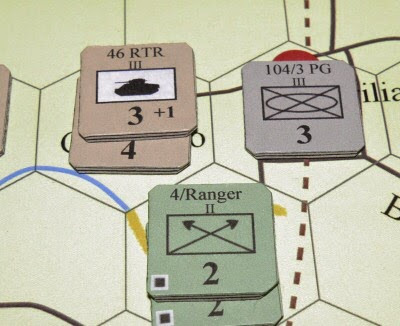 In the north, the Germans launch powerful attacks, but in each case they roll badly, the only success is that the Panther stack pushes back the 46th RTR, but with other attacks failing, they dare not press their advantage (advance after combat) as they will get ensnarled in the enemy lines. Although the Germans have a lot of armour here, they only get to use their armour bonus if fighting with enemy armour and in this sector, there is less of that about, so the armour stacks are not always fighting to their full potential. Bombardment gives 2 hits and the Random Event roll gives a 'no event' result. U.S. troops surrender at Cisterna. No Allied attacks this turn as they try to re-organize their lines. The attacks from out of the Pontine Marshes start to pay off. The Order of Battle card requires that 3 German regiments must withdraw from play this turn. The Panther battalion with Elephant assault gun support, push the Americans out of Aprilia. Steady German progress is made along both sides of the Mussolini Canal, pressing into the American flank. The bombardment gives 2 hits and the Random Event is 'A German Offensive', so they will get a +2 column shift in one of their attacks. The artillery strike destroys the elephant unit and the Allies counter-attack against the lone panther battalion, which though taking heavy losses, manages to hold on to the settlement. The German attacks do not bring much success, except they take Conca, a small but geographically significant settlement, isolating the American unit on the other side of the bridge. regiment on the other side of the canal to be cut off. The bombardment gets 1 hit and the Random event is 'No event'. The panther battalion holding Aprilia is decimated. At the canal 180/45th (one of the few remaining Allied reserves) moves to assist the newly cut off regiment by opening up a supply line. The German parachute regiment moves into a threatening position. 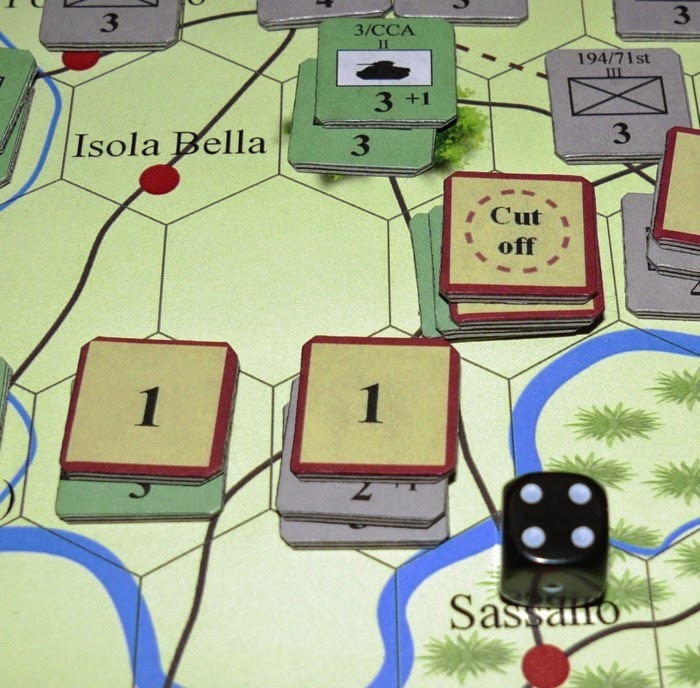 Further south the U.S. line comes under more pressure as 12/4th FJ slip across the lower part of the Mussolini canal in an effort to unhinge the American flank. The bombardment gives 2 hits and the Random Event gives another German Offensive bonus. 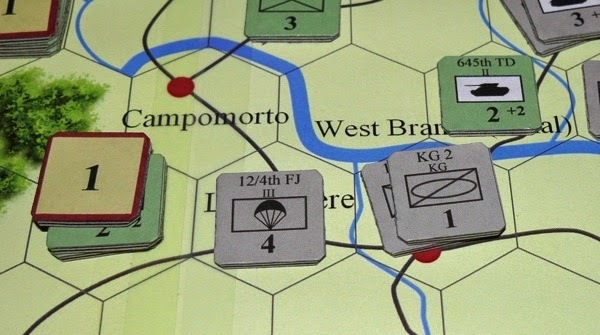 The bombardments have been ripping the German armour apart in the north and what started out as an impressive attack capability is fast dwindling with Campoleone once again looking vulnerable - though it survives a ground attack this turn. A Tiger battalion (508th) led stack pushes the 46th RTR back, giving some breathing space around Campoleone. 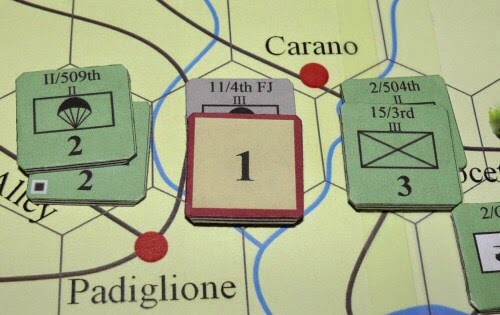 There is not enough game time left for the British to gain Campoleone and exit a unit there, so this game will be decided on casualties and occupation of settlements. The 12/4th FJ use the Offensive bonus to capture La Ferriere. The bombardment gives 2 hits, while the Random Event gives a 'no event' result. The 12/4th FJ at La Ferriere manage to hang on despite two significant attacks inflicting heavy casualties. Around Campoleone, the Tiger unit and four regiments hold the line. The final turn has been played. The Allied right flank is under considerable pressure. Conclusions - As neither side were able to get their prime objectives, the winner is established based upon casualties and settlements held. The Germans score 13 and the Allies 29 victory points, so the game ends as a minor Allied win. This is not an unusual outcome of the game. The prime objectives are hard to get, though in this game the Allies nearly made it off at Campoleone, twice putting it under pressure, while the Germans got nowhere near their objectives (the woods or Anzio or Nettuno). I like the system and the game that it gives, despite a smallish map, the geography, disengagement rules, bog rules and single stack attacks bring a lot of nuances into play and there are a lot of different things happening at any one time over that fairly small map. I think those final victory points could be tweaked so that the German player can turn these sort of situations into something that feels more like a draw - though no matter how you dress it up, a German failure to eject the invaders must inevitably a defeat over the longer term. They did prevent an early Allied victory in the region but not without high cost and the diversion of troops from other places. Never-the-less it is perhaps something that I might try and refine, with perhaps the units lost to bombardment not counting for VP purposes. 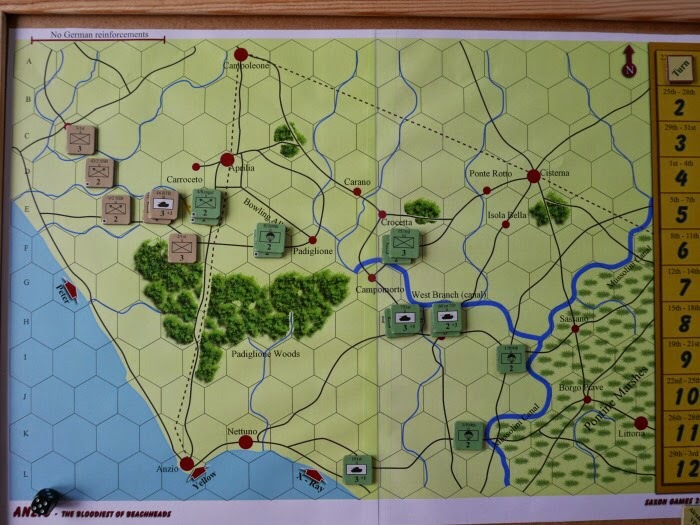 Solitaire - Anzio is a two player game that plays fine solitaire, much of the design and initial play testing was done solitaire and this AAR is a solitaire effort. The Random Effects Table also helps solitaire play. Complexity - I rated the game 4, mainly because it does some things differently, but I think it is an easy system to play and probably rests a tad below 4 for the first game and at 3 for subsequent games. There is a 4 page playbook and this has a section called 'Remember these rules'. It is a handy one column refresher to read before play to catch those smaller rules or system quirks that can be easily forgotten. Time - This will play in a short evening. It is fine for a midweek game and can play to conclusion in around two hours. Size -Being a DTP game, this can be printed out to a size of the users choice, with a standard size being just two panels of A4 (or letter) on a home printer, with the blown up version being double that. You will need a side area to put out two A4 Order of Battle cards. The game is small enough to be used for vacations etc.